With numerous awards and unprecedented achievements, Luis Fonsi continues to break world records, cross borders and make history with his music. The multi-platinum and five-time Billboard award winner, who will release his highly anticipated ninth studio VIDA worldwide on February 1, was honored with seven Guinness World Records titles for his chart-topping and making history with his worldwide hit “Despacito.” Additionally, he became YouTube’s “Top Five Most Viewed Artist” of 2018 by reaching more than 7.6 billion combined views with “Despacito,” “Échame La Culpa” featuring Demi Lovato, “Calypso,” and his latest hit “Imposible.” Also in 2018, the Puerto Rican singer and songwriter won seven Billboard Latin Music Awards and five Latin Grammy Awards. In addition to his commitment as the spokesperson for St. Jude Children Hospital’s “Thanks and Giving” campaign, Fonsi is an ambassador of Puerto Rico’s Tourism and is the founder of Luis Fonsi Foundation to help victims of Hurricane Maria. 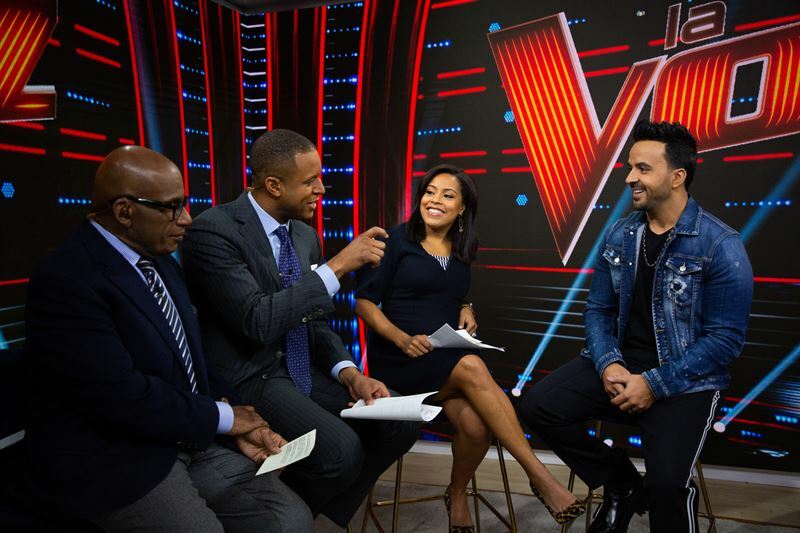 Telemundo’s LA VOZ (The Voice), hosted by renowned TV personality Jorge Bernal, features award-winning Latinx music megastar Luis Fonsi, Alejandra Guzmán, Carlos Vives and Wisin, as Coaches of the first-ever Spanish-language edition for the U.S. to discover some of the most promising Spanish-speaking vocalists in the nation. Fans can join Telemundo.com/LaVoz and its YouTube channel and follow Facebook, Twitter and Instagram @LaVozUS using #LaVozUS, and join all the action of their favorite team with the Coaches hashtags: #TeamFonsi; #TeamGuzman; #TeamVives; and #TeamWisin. NBC News pioneered the morning news program when it launched TODAY in 1952 with Dave Garroway as host. For more than 60 years, TODAY has provided a daily live broadcast of the latest in domestic and international news, weather reports, and interviews with newsmakers from the worlds of politics, business, media, entertainment and sports. TODAY is renowned for providing its audience with a “window on the world,” bringing viewers breaking news as it happens and often broadcasting from locations around the globe. TODAY’s longtime home at New York’s Rockefeller Plaza attracts thousands of visitors each year to peer into its windows and become part of TODAY’s broadcast. Don Nash is the executive producer. Emmy Award and Grammy Award winner Jimmy Fallon brought NBC's "The Tonight Show" back to its New York origins when he launched "The Tonight Show Starring Jimmy Fallon" from Rockefeller Center in 2014. Fallon puts his own stamp on the storied NBC late-night franchise with his unique comedic wit, on-point pop culture awareness, welcoming style and impeccable taste in music with the award-winning house band, The Roots.